Ready for the GlampItalia Revolution…? After 10 years of so, the Glamping (glamorous camping) trend in the UK shows no sign of cooling off, with new campsites popping up all the time and there are hundreds, maybe even over a thousand of such sites in the UK. By glamping I mean the holiday experience of staying on a site which has structures (mostly nomadic canvas tents), with a level of comfort above that of ‘traditional’ camping. (Personally I dislike the word ‘glamping’, with its connotations of drinking martinis around a fire and a sanitised experience of nature, but it has become the all-encompassing term for this type of holidaying). Of course, living in luxury in nomadic tents isn’t a new thing by any means: the Mughal Emperors, for example, in the 16th century travelled with entire cities of nomadic tents with a large and opulent palace tent for the Emperor which had the most ornate decorations and was sumptuously furnished. (To give you an idea of the standard – the Taj Mahal was built by one of the Mughal Emperors). The market for these sort of holidays is big in the UK as the UK has a strong tradition of outdoors and camping holidays and many know the experience of pitching a tent in the rain or taking a caravan park with rows of identical caravans, so the glamping idea presents something more comfortable and closer to nature, and now has become a mainstream vacation. These sort of sites, also lend themselves to spa-type of retreat or a luxury resort with a natural edge. Over the years we, as tent makers, have been involved in the setting up and/or maintenance of a very many of these sites in the UK, other countries in Europe and Israel. After looking for many many years to find a place where we can build a campsite of our own – Abruzzo, known as the Green Heart of Europe, called us into its heart of hearts two years ago and we have been building up Heartland, our own wild, yurt campsite in the Majella Mountains. The Italian rural mountain villages in this area are generally very traditional and conservative with few foreigners, but the local people have been overwhelmingly open to us from the start. (A while after we first arrived, even the local priest came to our little house on a dirt road, in full ceremonial dress and blessed us and the house with prayers and holy water. And local farmers drive by in their tractors and deliver boxes of fresh produce). The main 12 hectare site is in an isolated place a few km from the village and is not yet accessible without a 4×4 vehicle, which means that it is only the adventurous and/or inquistive who make the journey. The locals might have not fully understood what we were intending to do down there but the support and positive reports given by visitors and participants in events, have created a sort of excitement in the village, about the ‘English’, who have brought new energy to the area. However, as you may have read in previous posts, these mountain villages are suffering from the disease of rural depopulation, which means the outlying farmlands have become overgrown and abandoned, and the younger generation have left, meaning that there is no one to continue the traditional ways of agriculture.. The are old ways still there : the families going out to pick their olives at harvest time, the old people getting their wood for the winter taking a picnic into the fields, the guy going out at first light all summer to look for truffles, the knowledge of the day in June when, if it rains it will be a bad year for the olives and the day in September when you can tell if it will be a cold winter. The traditional recipes, of sowing seeds. These old ways are disappearing as the village collapses in towards the centre leaving the outlying properties and lands to be taken over by the overgrowth of forest and wild boars. There are whole olive fields abandoned and classic stone houses and barns falling into ruin. So GLAMPING TO THE RESCUE…we are bringing the glamping model to local land owners to start initiatives with anything from a single yurt B&B in their field, to complete campsites with several units and a restaraunt. This sustainable tourism allows farmers to supplement their income and brings people and energy to these abandoned areas. Italy is ready for a GLAMPING REVOLUTION with the idea already caught in the North and slowly filtering down from the North to Abruzzo which is surprisingly undiscovered as a holiday destination, with its wild mountains, medieval villages perched on the mountaintops, national parks full of wildlife and the Adriatic coast with its endless beaches. We certainly don’t want to encourage a massive influx of tourism to this magical area, but slow, sustainable tourism is a needed to boost the area, and bring life to the lands. 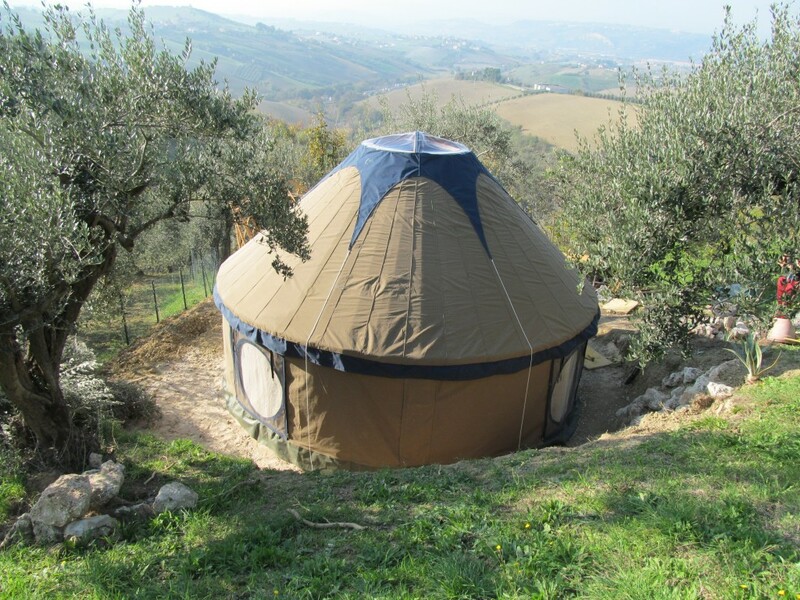 As pioneers in the industry, we are enflaming this revolution in Italy, and alongside Heartland, our wilder site, we are working with an Italian partner to set up a campsite at the top of Torricella Peligna, the local town to Heartland, which will be a shop window of sorts, for the glamping scene. People who are new to the glamping idea and interested in setting up an initiative can experience it first hand, as well as experienced site owners getting some new ideas. This site will feature examples of the possiblities for a eco-site: yurts, safari tents, tipis, shepherd’s huts, wooden saunas, hot-tubs, compost toilets, off-grid energy solutions as well as access to experts in the field offering business advice from geographical considerations to finance and marketing. The GlampItalia Revolution is on. Get in touch if you are looking to start a new eco-tourism initiative in Italy, or want to expand an exisiting site with new ideas or are have suitable product to put out to the Italian market.